Chocolate is usually not considered a diet food but cocoa itself has beneficial anti-inflammatory properties. It is usually the other ingredients added to chocolate that make it a dieter's foe. 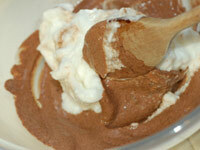 This chocolate mousse uses 70% cocoa chocolate this contains much less fat and sugar then a conventional chocolate bar. 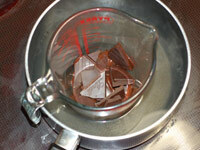 Break chocolate into a pirex jug and gently heat the jug in saucepan of water. When the chocolate is fully melted take the jug out of the saucepan and allow it to cool for a few minutes. Separate the egg yokes from the white. 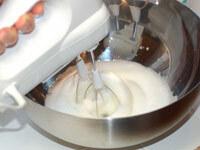 Add the sugar to the whites and whisk them until they become firm and form soft peaks as the whisk is removed. 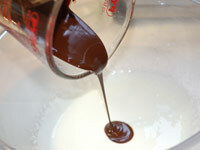 Add the chocolate to the yogurt and mix them together well. Fold the egg white into the chocolate yogurt and then spoon the mixture into ramekins or what ever bowls or glasses you have to hand. Refrigerate the mixture for 2 hours to allow it to set. 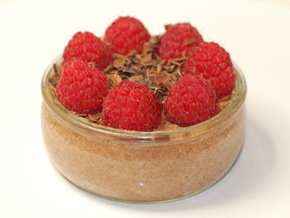 Just before serving arrange the raspberries on top and use a potato peeler to create chocolate shavings for decoration.